R.I.P. 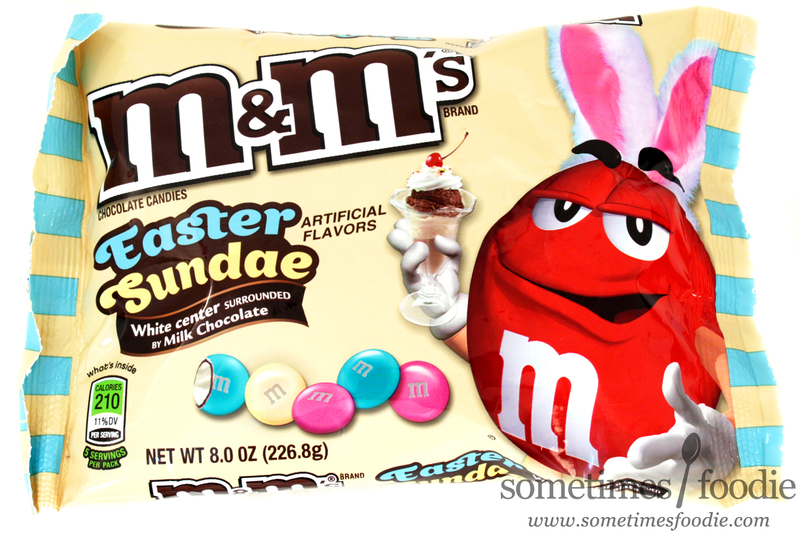 my beloved Carrot Cake m&m's, you had a good run, but Easter Sundae has taken your place as the Walmart exclusive flavor this year. I know a lot of food bloggers didn't really care for them, but I'm sad to see them go. (They were the perfect addition to oatmeal and carrot cake cookies for spring!) Even though I was heartbroken by the seasonal flavor swap, I was kind of excited too. When I think of ice cream sundaes I think of hot fudge, cherries, Neapolitan ice cream, and whipped cream. 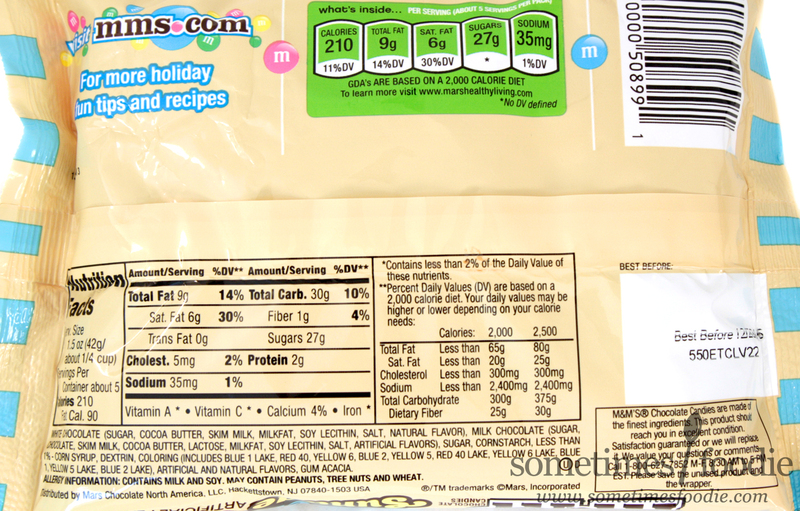 Judging by the name, I thought this was going to be some kind of candy equivalent to those banana split style ice creams that pack multiple flavors into one pint, but it turns out this is just a chocolate and vanilla m&m. I don't know if my expectations were too high, but this sounds boring to me. Oh well, let's see if this sundae is worthy of taking Carrot Cake's place. The seasonal design is pretty nice this year. We have a warm creamy backdrop with little bits of cyan blue to add some color contrast with a spring-y edge, and Red's magical floating eyebrows have been accessorized with a pair of fuzzy bunny ears that are much larger and fluffier than the ones Green wears on the Strawberry Shortcake bag. I absolutely love the color scheme they went with. This mixture of pink, blue, and cream is very spring-y and bright and even though Red sticks out like a sore thumb from all this pastel goodness, he kind of adds to the sundae theme by being the "cherry on top." Inside the candies mimic the colors shown on the bag, we have a creamy off-white, a bright cyan, and this slightly muted rose color. 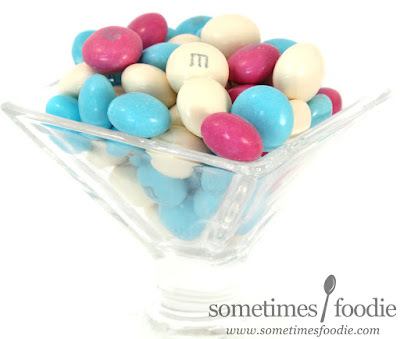 They look pretty nice in a candy dish, but I wish the pink had been brighter and more like the pinks that were in the Strawberry Shortcake mix. This color feels too bold and heavy compared to the brightness of the other two. And just like the bag showed, these are another layered confection. We have a sugary shell, a layer of milk chocolate, and a white chocolate center. 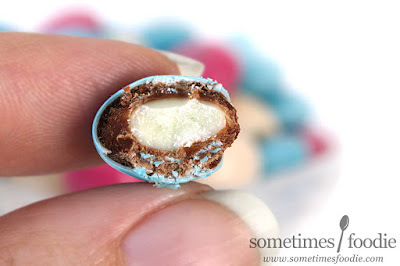 The chocolate layer is way thicker than the bag made it look, and at first this tasted like a normal m&m, but when the white chocolate started to melt you got a much creamier vanilla note to this candy which was pretty pleasant. I won't be shedding any tears when these leave the shelves, and I won't be grabbing any bags to stockpile away for later, but I will happily consume the rest of this bag and mix and match it with the other half-finished seasonal m&m's I have in my food stash. It's a nice compliment to other flavors, but on it's own it's pretty "meh" to me. 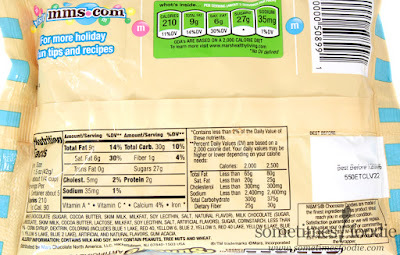 An Aero-style m&m would be really interesting, I wonder if they can do that and still have the panned-style sugar shell.